for the BLUE-CarbA study group. Introduction The dramatic increase of the incidence of infections caused by extended-spectrum beta-lactamase-producing Enterobacteriaceae (ESBL-PE) has led to an increase of 50% of carbapenem consumption all around Europe in only 5 years. This favours the spread of carbapenem-resistant Gram-negative bacilli (GNB), causing life-threatening infections. In order to limit use of carbapenems for infections actually due to ESBL-PE, health authorities promote the use of rapid diagnostic tests of bacterial resistance. The objective of this work conducted in the intensive care unit (ICU) is to determine whether an early de-escalation of empirical carbapenems guided by the result of the βLACTA test is not inferior to the reference strategy of de-escalating carbapenems after the antibiogram result has been rendered. Methods and analysis This multicentre randomised controlled open-label non-inferiority clinical trial will include patients suffering from respiratory and/or urinary and/or bloodstream infections documented with GNB on direct examination and empirically treated with carbapenems. Empirical carbapenems will be adapted before the second dose depending on the results of the βLACTA test performed directly on the microbiological sample (intervention group) or after 48–72 hours depending on the definite antibiogram (control group). The primary outcome will combine 90-day mortality and percentage of infection recurrence during the ICU stay. The secondary outcomes will include the number of carbapenems defined daily doses and carbapenem-free days after inclusion, the proportion of new infections during ICU stay, new colonisation of patients’ digestive tractus with multidrug-resistant GNB, ICU and hospital length of stay and cost-effectiveness ratio. Ethics and dissemination This protocol has been approved by the ethics committee of Paris-Ile-de-France IV, and will be carried out according to the principles of the Declaration of Helsinki and the Good Clinical Practice guidelines. The results of this study will be disseminated through presentation at scientific conferences and publication in peer-reviewed journals. This study will be conducted as a multicentre randomised controlled and open-label non-inferiority trial. This will be the first large study to evaluate the usefulness of a rapid diagnostic test of bacterial resistance to refine empirical carbapenems to patients actually infected with extended-spectrum beta-lactamase-producing Gram-negative bacilli. The study’s main benefit will include reduced exposition of intensive care patients to carbapenems. Limitation related to the open-label design of the study (ie, absence of blinding) will be limited by a masked end-point assessment. Limitation due to potential confounding interventions used differently in participating centres will be limited by the stratification of the randomisation at the centre level. The rise of multidrug-resistant (MDR) pathogens, particularly of MDR Gram-negative bacilli (GNB), presents a grave public health challenge. The wide use of antimicrobials in human and animal medicine resulted in an intensive selective pressure that is considered to have been a major driving force towards antimicrobial resistance.1 Beta-lactam antimicrobials are the most commonly prescribed antimicrobial class in human medicine. They represented 71.7% of the total systemic antimicrobial consumption in France and 61.4% in Europe in 2016.2 This wide use of beta-lactam antimicrobials led to selection of extended-spectrum beta-lactamase-producing Enterobacteriaceae (ESBL-E), whose spread has been exacerbated by inadequate implementation of infection control measures. Described for the first time in the 1980s,3–5 this resistance phenotype has now widely spread both in the hospital setting and in the community, notably in Escherichia coli. This led to human and animal pandemics all over the world.6 In French intensive care units (ICU), incidence of infections due to ESBL-E among all Enterobacteriaceae increased from 6.8% to 16.8% between 2010 and 2016.7 Acquisition by Enterobacteriaceae of plasmids coding for an ESBL confers a high level of resistance to beta-lactam antimicrobials, and often to various other antimicrobial classes such as fluoroquinolones and aminoglycosids.8 In the absence of strong evidence supporting the use of alternatives, carbapenems remain the antimicrobial of choice to treat infections due to ESBL-E in ICU patients.9 Consequently, carbapenem consumption rapidly increased from 25% to 50% all around Europe in only 5 years.2 10 Thus, controlling carbapenem consumption appears as a global challenge. Finally, carbapenems induce quantitative and qualitative decrease of intestinal microbiota.21 The use of imipenem for 48 hours was reported to markedly reduce the normal intestinal carriage of Enterobacteriaceae, streptococci/enterococci and anaerobes up to 2 weeks.22 These results suggest that reduction of carbapenem exposure could better preserve the microbiological intestinal barrier. Development of strategies to limit use of carbapenems is urgently needed, especially in vulnerable patients such as ICU patients. Among the possible leads, incorporation of rapid diagnostic tests evaluating bacterial resistance into our clinical practice may help reduce inappropriate exposure to carbapenems.23–26 Nevertheless, to date, rapid diagnostic methods enabling de-escalation of broad-spectrum antimicrobial emergency treatment according to the resistance pattern of involved bacteria have not been validated in a clinical setting. Consequently, in ICU, antimicrobial choice is based on protocols that notably take into account patients’ risk factors for colonisation with ESBL-E, such as those proposed by the American Thoracic Society27 or by French critical care societies.28 However, this strategy is questionable because <25% of healthcare-associated infections diagnosed in ICU patients colonised with ESBL-E are really due to ESBL-E,29 30 thus leading to overprescription of carbapenems. In this setting, the use of a rapid phenotypic test detecting the production of an ESBL by the GNB responsible for the infection may help limit carbapenem use to infections actually due to ESBL-producing GNB. Recent developments of the BLT allow its use on bacterial pellets directly obtained from microbiological samples positive for GNB on direct examination. The sensitivity and specificity of the BLT to detect ESBL-producing GNB reached 100% and 100%, respectively when performed on bacterial pellets from urine samples36; 100% and 94% on bacterial pellets from positive blood cultures37 and 99% and 100% on bacterial pellets from bronchial aspirate samples.38 Thus, a clinical study investigating early de-escalation of carbapenems based on BLT results within the first hours of the empirical treatment would support early restriction of carbapenems to infections actually due to ESBL-E. This could dramatically decrease carbapenem exposure in ICU patients. The main objective of this study is to determine among ICU patients documented with GNB infection on direct examination, if early de-escalation of empiric carbapenem use guided by the result of a rapid phenotypic diagnostic test of bacterial resistance (BLT, Bio-Rad, California, USA) is not inferior to the strategy de-escalating carbapenem use on antibiogram results at 48–72 hours. The secondary objectives are to compare the two strategies in terms of efficacy on the: (1) total exposure to carbapenems; (2) occurrence of other infections; (3) colonisation of the digestive tract of patients with ESBL-E, CP-E or MDR GNB; (4) total use of ICU and hospital resources and the cost-effectiveness of early de-escalation guided by the BLT. 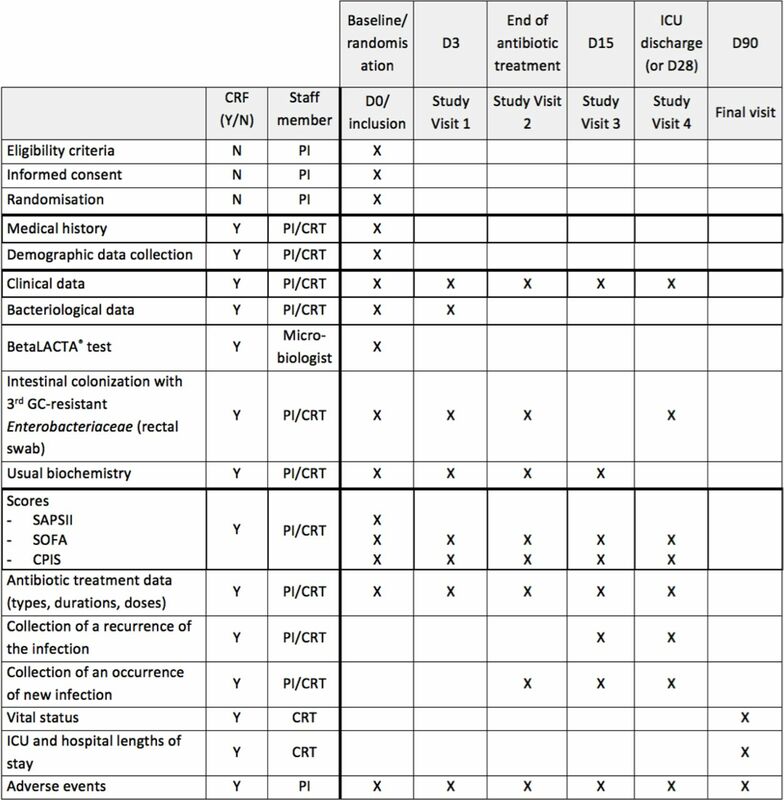 The BLUE-CarbA trial is a multicentre randomised controlled open-label non-inferiority clinical trial involving an in vitro diagnostic medical device with two parallel groups, with the primary end point combining 90-day mortality and percentage of infection recurrence. The 30 French participating centres are listed in table 1. This article follows the Standard Protocol Items: Recommendations for Interventional Trials (SPIRIT) reporting guidelines.1 SPIRIT checklist is available in online supplementary file 1. The WHO trial registration data set is available in online supplementary table 1. Patients will be considered candidates for inclusion in the study if they suffer from a suspected pneumonia and/or urinary tract infection and/or primary bloodstream infection (box 1), leading to an empirical carbapenem prescription, with the documentation of ≥2 GNB/field on direct examination of a tracheobronchial aspirate sample, urinary sample or blood culture. Full inclusion and exclusion criteria are detailed in box 2. Both patients presenting healthcare-associated infections and community-acquired infections may be included since they will present as increased risk of infection due to ESBL-E, indicating empirical carbapenems. Pneumonia is defined as the presence of ≥2 criteria of the modified Clinical Pulmonary Infection Score: fever >38.5°C, leucocytosis >11.109/L or leucopoenia <4.109/L, purulent tracheobronchial secretions, PaO2/FiO2<240 without Acute Respiratory Distress Syndrome (ARDS) diagnosis and new or persistent infiltrate on chest radiography. Urinary tract infection (UTI) is defined as the presence of ≥2 UTI criteria according to Infectious Diseases Society of America (IDSA) guidelines: new onset or worsening of fever, rigours, altered mental status, malaise or lethargy with no other identified cause; flank pain; costovertebral angle tenderness; acute haematuria; pelvic discomfort and in those whose catheters have been removed, dysuria, urgent or frequent urination, or supra-pubic pain or tenderness, in absence of any other identified source of infection. Primary bloodstream infection is defined as the presence of ≥1 criteria according to the definition of the Centers for Disease Control and Prevention: fever >38°C, chills or hypotension in absence of any other identified source of infection. Intensive care unit patients aged at least 18 years. Suffering from suspected pneumonia and/or urinary tract infection, and/or primary bloodstream infection (table 1). Leading to an empirical carbapenem prescription for <6 hours. With the presence of ≥2 Gram-negative bacilli/field on direct examination of a tracheobronchial aspirate sample, urinary sample or blood culture. Written informed consent signed by the patient, the next-of-kin or close relative; or inclusion in case of emergency (followed by written informed consent signature by the patient as soon as possible). Participating in a social security scheme or benefiting from such a scheme by means of a third party. Ongoing treatment with carbapenems for another infection. Participation in another interventional study pertaining to an anti-infective treatment, whose primary aim is mortality and/or recurrence of the infection. Patients in whom a procedure of withdrawing life-sustaining treatment was decided before inclusion. Patient likely to die in the 48 hours following inclusion. Patients benefiting from reinforced protection or persons deprived of freedom subsequent to a legal or administrative decision, majors under legal protection. All patients included in this study will be randomised in one of the two treatment groups, which are based on the method to de-escalate empirical carbapenems. Empirical carbapenem treatment will be started just after bacteriological sampling. The choice of the carbapenem class for empirical antimicrobial therapy, the type of carbapenem (imipenem/cilastatin, meropenem or ertapenem) and its dosage will be left to the discretion of the attending physician, based on the clinical context, local epidemiological data, previous patient’s antimicrobial exposure and risk factors for carriage or documented colonisation with MDR GNB. Since at least one bacteriological sample will be positive for at least 2 GNB/field on direct examination, the microbiologist will perform a BLT on the bacterial pellet isolated from the positive sample(s), and then the patient will be included and randomised in the « experimental » or « control » group (figure 1). Study design. AST, antimicrobial susceptibility test; BLT, βLACTA test; GNB, Gram-negative bacilli. In the experimental group, the BLT result will be given to the attending physician. If the test is positive, empirical carbapenem will be continued until the final results of the antimicrobial susceptibility test became available. If the test is negative, carbapenem will be de-escalated from the second dose to cefepime or ceftazidime according to local ecology and usual practice in each centre. 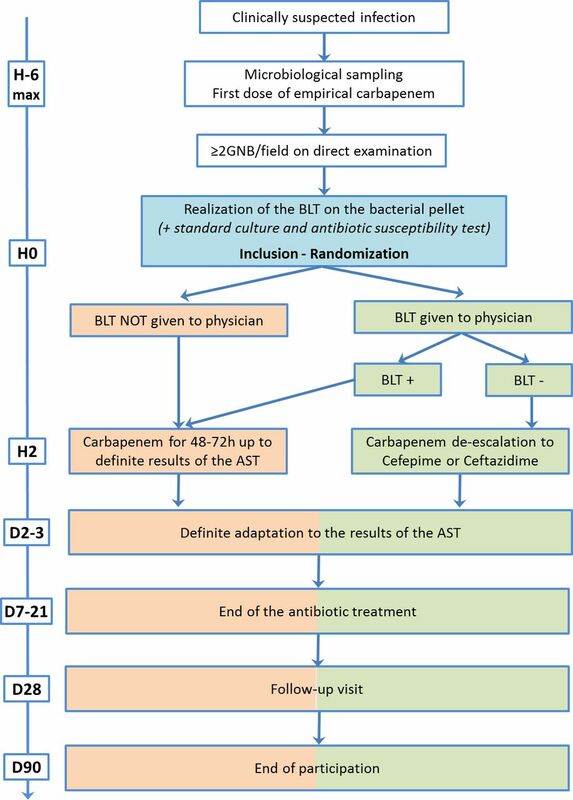 In the control group, the BLT result will not be given to the physician and patients will receive empirical carbapenem until the final results of the antimicrobial susceptibility test became available (figure 1). Patients will be randomised after inclusion by the principal investigator in each centre, using a secure web-based randomisation system (electronic case report form (e-CRF) CleanWeb, Telemedecine Technologies, Boulogne-Billancourt, France). Centralised blocked randomisation will be stratified on centre and will be prepared by the Clinical Research Unit (URC-EST). Patients will be randomly assigned (1:1) to one of the two treatment groups, based on the method used to de-escalate the empirical carbapenem treatment. Local microbiologists will receive an email with strategy allocated to the included patient. Masking of the patients, ICU staff and microbiologists will not be feasible due to the design of the study and the early adaptation of empirical carbapenems guided by the results of the BLT in the experimental group. However, the experts of the end point adjudication committee and the statisticians will be masked to the group assignment. Composite end point combining 90-day mortality and proportion of infection recurrence (same GNB on the same site of infection) during the ICU stay (within the limit of 90 days). Number of days with carbapenem treatment after inclusion during ICU stay (within the limit of 28 days); number of carbapenems defined daily doses after inclusion during ICU stay (within the limit of 28 days); number of carbapenem-free and antimicrobial-free days at day 28 after inclusion. Proportion of new infections (same site of infection with another bacteria or other site of infection) during ICU stay (within the limit of 90 days). New colonisation of patients’ digestive tracts with ESBL-producing and carbapenemase-producing GNB at day 3 and at the end of antimicrobial treatment of the current infection. ICU and hospital lengths of stay following randomisation; total cost and incremental cost-effectiveness ratio (cost per additional death/infection averted). Recurrence of the infection that led to inclusion will be suspected by the attending physician. Then, the definite diagnosis of recurrence will be confirmed or denied a posteriori by three independent experts in the field of infectious diseases and critical care medicine, blinded to the allocation group and part of the end point adjudication committee. Using the entire clinical, biological and radiological records of concerned patients, experts will assign a grade corresponding to the probability of recurrence based on the infection definition criteria (box 1), according to a 5-level probability scale. Agreement among the scores given by the three experts will be assessed. Grades 1 and 2 will refute the diagnosis of recurrence, while grades 4 and 5 will confirm the diagnosis of recurrence. In case of disagreement between the experts, the diagnosis will be made on the basis of the majority response. Patient inclusion will take place as soon as possible after their screening by the attending physician in order for randomisation to occur before the second carbapenem dose. Thus, inclusion will be considered if the first dose of carbapenem has been administered <6 hours before in order to let the laboratory perform the direct examination, and the BLT in case of sample positive for GNB, before the second dose of carbapenem will be administered. After inclusion, patients will be monitored from randomisation to their discharge from the ICU without exceeding 90 days following inclusion. Evaluation of vital status 90 days after inclusion will be assessed by a study research technician. If the patient is no longer hospitalised, he will be called in order to document his vital status. In the absence of response after three attempts, the patient’s physician and emergency contact will be called. In the absence of response, the vital status will be collected via a contact with the town council of patient’s birthplace. Consequently, the entire follow-up period will be 3 months after randomisation (figure 2). BLUE-CarbA schedule of forms and procedures. CRT, clinical research technician; PI, principal investigator. Any patient can withdraw from participation at any time and for any reason, without having to provide justification. The investigator can end participation temporarily or permanently for any reason that affects patient’s safety. In both cases, patient care will not be altered. If a subject leaves the research prematurely, data already collected before the patient exits the study can be used, but the outcome will not be taken into account in the final analysis. If consent is withdrawn, no data about the patient will be used unless the subject states in writing that he/she does not object. Data will be collected in an e-CRF, via a web browser with access restricted to investigators. Data will be completed by investigators for each follow-up visit with the help of an independent clinical research technician. Data from the hospital discharge database will be extracted directly from the hospital’s information system. Patient identifiers will be removed and replaced by the inclusion number before transfer to the statisticians in charge of the cost-effectiveness analysis. All personnel involved in data analysis will be masked. Only the sponsor and statisticians will have access to the final data set. The sponsor and investigators are subject to professional secrecy and will take all necessary precautions to ensure confidentiality of patient information and results obtained. Consent forms will be archived by the sponsor and investigators for 15 years following the end of the research and stored in sealed envelopes in a locked, secure office. Clinical and outcome data will be electronically stored on double password-protected computers. To meet the secondary objective concerning patients’ digestive tract colonisation with ESBL-GNB and CP-GNB in the two study groups, a rectal swab with bacterial culture on dedicated selective medium will be performed at inclusion, at day 3 and at the end of the definite antimicrobial treatment. To determine the nature of ESBL enzymes produced by GNB isolated either on the microbiological samples used for the diagnosis of the infection leading to inclusion (ie, bronchial aspirate, urinary sample or blood culture), or on cultures of rectal swabs used for the assessment of digestive colonisation, ESBL-GNB strains will be collected and frozen at −20°C in each centre, and then included in a biological collection. At the end of the study, all frozen strains will be analysed in a central specialised laboratory (GHUEP microbiological laboratory, Paris). At the end of the research, the biological collection will be stored for 5 years and then destroyed. The collection will be declared to the minister responsible for research and to the regional health authority according to French law. The number of patients is calculated from an estimation of mortality and/or incidence of recurrence of GNB-related infection in ICU of 45% in the control group as previously described. A sample size of n=307 patients/group will provide 80% power to demonstrate non-inferiority of the experimental group, considering a non-inferiority margin of 10%, using a CI method with a 95% one-sided CI. With a conservative hypothesis of 5% of patients lost to follow-up or with major protocol violations, a total of 646 patients are expected. Since BLUE-CarbA is a non-inferiority study, the analysis of the primary end point will be performed on per-protocol population (all randomised patients without major protocol deviation or those who withdrew consent).40 A sensitivity analysis will be performed following the intention-to-treat (ITT) principle (all randomised patients, except those who withdrew consent). Analysis will be performed blind to treatment groups. Missing data will be not replaced except for the principal criteria for the sensitivity analysis on ITT population. Missing value will be considered an event whatever the randomised group. Categorical variables will be reported per group as numbers and percentages, while continuous variables will be summarised using means (±SD) or medians (IQR) for normally and non-normally distributed data, along with their respective 95% CIs. Analysis of secondary end points will be performed using Student’s t-test or Wilcoxon rank sum test for continuous variables according to their normal or non-normal distribution (number of days with carbapenem treatment, carbapenem defined daily doses, carbapenem-free and antimicrobial-free days), and χ² test or Fischer’s exact test for categorical variables (percentages of new infections and colonisation of the digestive tract). Composition and modification under treatment of the intestinal microbiota will be described. Clinical research associates will ensure that patient inclusion, data collection, registry and rapport are in accordance with the standard operating procedures of the sponsor (Assistance Publique-Hôpitaux de Paris) and the French Good Clinical Practices. They will verify during the quality control visits, performed every five patients included, in collaboration with investigators: the presence of written consent, compliance with the research protocol, the quality of data collected in the case report form and its consistency with the ‘source’ documents and the management of treatments used. The clinical trial will be carried out in line with the principles of the Declaration of Helsinki and according to the Clinical Trials Directive 2001/20/EC of the European Parliament on the approximation of the laws, regulations and administrative provisions of the Member States relating to the implementation of Good Clinical Practices in the conduct of clinical trials on medicinal products for human use. This approval covers all participant centres. As an in vitro diagnostic medical device will be used in the study, authorisation from the French national drug safety agency (ANSM) has been obtained. Free and informed written consent of patients will be obtained by the investigator prior to inclusion in the study. In accordance with the French Public Health Code, if the patient is unable to sign, the informed consent may be obtained from next-of-kin or close relative. Furthermore, due to the short delay between the first and second administration of empirical carbapenems during which the patient could be included, a procedure for inclusion for emergency situations would be applied. In these last two situations, a continuation-of-care consent for the study will be signed by the patient as soon as possible, using a specific note of information and consent. The results of the study will be released to the participating physicians and microbiologists and medical community through presentation at scientific conferences and publication in a peer-reviewed journal. The publication will acknowledge the sponsor (Clinical Research and Development Department of Assistance Publique-Hôpitaux de Paris, APHP, France) and the financier (Programme Hospitalier de Recherche Clinique 2015, French Ministry of Health). This study is registered on clinicaltrials.gov (NCT03147807). According to data-sharing policy, patient-level data that support the findings of this study will be available from the authors on reasonable request and with permission of the sponsor (Clinical Research and Development Department of Assistance Publique-Hôpitaux de Paris, APHP, France), owner of the data. Patients and public were not involved in the study design, recruitment or conduction of the study. The burden of intervention was assessed by representatives of patient associations participating in the ethical committee. Participants may obtain access to the final results of the study through the local principal investigator, as mentioned in the individual consent form. To the best of our knowledge, this study is the first large-scale study to evaluate the usefulness of a rapid diagnostic test of bacterial resistance to limit empirical carbapenem use to ICU patients actually infected with ESBL-producing GNB. In the other cases of unnecessary broad-spectrum carbapenem prescriptions, which could reach >80% of cases,29 30 this study will evaluate the non-inferiority of its de-escalation to cephalosporin as early as the second beta-lactam delivered dose. At an individual level, the benefits are expected to include reduced exposition to carbapenems, which may help preserve patient’s gut microbiota and reduce digestive acquisition of carbapenem-resistant GNB. At a collective level, decreasing carbapenem daily doses will reduce the selective pressure and prevalence of carbapenem-resistant GNB, including that of public health-threatening carbapenemase-producing GNB. We believe that the present study has several strengths. First, the number of patients to be included has been calculated according to an expected rate of 45% for the primary composite end points combining 90-day mortality and infection recurrence. This is in accordance with previous published studies in which 90-day mortality following ICU-acquired infections was about 30%43–45 and infection recurrence between 15% and 30%.46 47 Second, we will use an inexpensive in vitro medical device that does not require any special equipment and whose use directly on bacterial pellets has been validated with sensitivity and specificity above 99% when performed on urinary sample, blood culture and tracheabronchial aspirates.36–38 This phenotypic approach would allow for rapid ESBL-detection at lower cost, however without providing information on bacterial species. Finally, previous developments of the BLT would allow the inclusion of patients with the most frequent infections both leading to ICU admission and acquired during the ICU stay (ie, ventilator-acquired pneumonia, urinary tract infections and bacteraemia), thus largely targeting the mains sources of carbapenem prescriptions in ICU. Our study is an open-label study, as a double-blind design is not possible, considering the early βLACTA-guided de-escalation strategy in the experimental group on one hand and the later antibiogram-guided de-escalation in the control group on the other. Other non-protocolised interventions may influence patients’ prognosis and act as potential confounding variables, especially considering that they may not be used identically in all centres. However, this will be controlled by the stratification of the randomisation at the centre level and adjustment of statistical analyses in cases of differences between groups. In conclusion, this trial is the first multicentre randomised controlled open-label study adequately powered to test the hypothesis that an early BLT-guided carbapenem adaptation decreases patients’ carbapenem exposure while being as safe as usual de-escalation based on antimicrobial susceptibility test. European Center for Disease Control. European Country Overview of Antimicrobial Consumption. 2018 https://www.ecdc.europa.eu/en/antimicrobial-consumption/database/country-overview (Accessed 9 May 2018). InVS/REA-Raisin. Surveillance des infections nosocomiales en réanimation adulte. Résultats. 2018 file:///C:/Users/3166025/Downloads/rapport-surveillance-infections-nosocomiales-reanimation-adulte-2016%20(1).pdf (Accessed 13 Apr 2018). AMR-surveillance. Surveillance of antimicrobial resistance in Europe - Results. 2016. https://ecdc.europa.eu/sites/portal/files/documents/AMR-surveillance-Europe-2016.pdf (Accessed 13 Apr 2018). World Health Organization. Global action plan on antimicrobial resistance. 2015. http://apps.who.int/iris/bitstream/handle/10665/193736/9789241509763_eng.pdf;jsessionid=461DF412304F7A46F640DEE4DDCEC9F5?sequence=1 (Accessed 17 Apr 2018). The White House. National strategy for combating antibiotic-resistant bacteria. 2014. https://obamawhitehouse.archives.gov/sites/default/files/docs/carb_national_strategy.pdf (Accessed 17 Apr 2018). Interministerial Committee on Health. French interministerial roadmap for controlling antimicrobial resistance. 2016. http://www.plan-antibiotiques.sante.gouv.fr/IMG/pdf/Interministerial_AMR_Roadmap_FR_Nov_2016_wo_annexes_-EN_docx.pdf (Accessed 17 Apr 2018). Review on Antimicrobial Resistance. Tackling drug-resistant infections globally: final report and recommendations. 2016. https://amr-review.org/sites/default/files/160525_Final%20paper_with%20cover.pdf (Accessed 17 Apr 2018). Contributors MG conceived the study, coordinated its design and drafted the manuscript. MG and CQ wrote the manuscript. SV, SG, YB, VL, A-LC, SS, EG, FC, J-LM and MM read and were involved in critical appraisal and revision of the manuscript. MM provided statistical expertise. All authors approved the final manuscript prior to submission. Funding This work is mainly supported by an institutional grant from the French National 2015 ’Programme Hospitalier de Recherche Clinique' (PHRC P150940–AOM15-15-0470). Bio-Rad contributed to the funding of the study, notably by providing the βLACTA tests free of charge. The study is sponsored by the Clinical Research and Development Department of Assistance Publique–Hôpitaux de Paris. Disclaimer The funders did not have any role in the study’s conception, nor will have any role in the data analysis or decision to submit the report for publication. Ethics approval Ethical aspects of the research have been approved by the ethics committee Paris-Ile-de-France IV (n°IRB00003835), France. Collaborators BLUE-CarbA study group: Marc GARNIER, Thomas LESCOT, Eric MAURY, Anne-Laure CONSTANT, Gersende FAVE, Emmanuel GUEROT, Shidasp SIAMI, Emmanuel WEISS, Cédric BRUEL, Pierre TROUILLER, Bruno MEGARBANE, Claire DAHYOT-FIZELIER, Sigismond LASOCKI, Marie-Christine HERAULT, Pierre-Louis DECLERCQ, Anne-Claude ROCHE, Paul-Michel MERTES, Martial TCHIR, Richard GALLIOT, Jean-David POMMIER, Benoit VEBER, Fabienne TAMION, Nicolas MONGARDON, Mohamed Hussem FOUFA, Vivien HONG HUAN HA, Sabina DJHOURI, Olivier DESEBBE, Philippe GUERCI, Gaston GROSSMITH, Matthieu LEGRAND, Sophie VIMONT, Salah GALLAH, Fabrice COMPAIN, Cécile FARRUGIA, Frédéric BERT, Alban LEMONNIER, Caroline ROUARD, Hervé JACQUIER, Christophe BURUCOA, Marie KEMPF, Yvan CASPAR, Elodie BLONDEL, Philippe RIEGEL, Jack BREUIL, Emilie CARDOT-MARTIN, Caroline JOUBREL-GUYOT, Martine PESTEL, Jean-Winoc DECOUSSER, Hélène POUPET, Frédéric FAIBIS, Florian LORME, Jacques THIERRY, Nejla AISSA, Claude BOSI, Béatrice BERCOT.